In this workshop presentation I present a brief overview of the ‘logics approach’ to critical explanation in social and political theory (Glynos & Howarth 2007). This approach claims to offer a conceptual framework that operationalizes basic principles of post-structuralist discourse theory for purposes of critical empirical research. Drawing on an ontology of signification and enjoyment, it is directly inspired by the work of Laclau & Mouffe, but it also takes inspiration from work linked directly or indirectly with the ‘Essex School’, especially those works bearing a psychoanalytic inflection (eg., Stavrakakis). Central to this approach is the pre-eminent role attributed to the political dimension of social relations, particularly the idea of the ever-present potential of public contestation or antagonism. It captures something of this idea through the concept of a political logic. Importantly, however, it situates the political dimension of social life in relation to a set of other dimensions, linked to ‘sedimented’ or ‘habitual’ practices and ‘affects’. It thereby supplements political logics with two further explanatory units: social logics and fantasmatic logics. Together, these three logics can enhance the critical dimension of empirical research and explanation by drawing out both normative and ideological aspects of critique. I use the UK finance crisis and reform process as a case illustration, showing very briefly how the logics approach can gain further analytical precision by means of what colleagues and I have called a ‘nodal framework’. The concept of populism has been used extensively to describe the radical change Venezuela – a Latin American petro-state – has experienced since the 1990s. This presentation doesn’t aim to provide an empirical and theoretical snapshot of this case study. However, two speeches of Lieutenant Colonel Hugo Chávez, the leader of Venezuela’s one-man show populist project, will be discussed. The other case, which seems at first glance to be poles apart from the Latin American case, is a review of the recent electoral success of an anti-European party in the United Kingdom. Based on the discourse used and its anti-Euro stance, I argue that this growing British party is populist. My theoretical observations and methods to analyse these types of populist politics is sketched out in the last section of the presentation. The 2014 European elections have confirmed the prominence in the media of what is commonly called the far right. While parties such as the Front National and UKIP were successful in the elections, their performance has often been exaggerated and they have benefited from a disproportionate coverage. Aiding their apparently ‘irresistible rise’, their normalisation was greatly facilitated by their description as ‘populist’ parties. However, while this term ‘populism’ has been almost universally accepted in the media, it remains a hotly debated concept on the academic circuit, and its careless use could in fact prove counterproductive in the assessment of the current state of democracy in Europe. Instead of focusing on the reasons behind the rise of these parties, similarities and differences already widely covered in the literature, this presentation will examine the reaction their rise has triggered within mainstream elite circles (the media, academia and the political class). In turn, it will demonstrate that a skewed and disproportionate coverage of the European elections in particular, and the ‘rise’ of ‘right-wing populism’ in general, have prevented a real democratic discussion from taking place and impeded the possibility of other political alternatives. From the outset, the affective dimension has been present in the analysis of populism (e.g. charismatic leadership, romantic Folkish references and so on). Nevertheless, more attention was given to discursive articulations and organizational aspects. Over the last fifteen years or so, with the advent of what has been called “emotional” or “affective turn” in the entirety of the social sciences and humanities, analysts of populism have been focusing on emotions in a more open and overt way. For instance, Taggart, Betz, Mouffe, Tagguief, Demertzis, Pantazopoulos and others have pointed to the need of bringing emotions well back into the analysis of populism, offering thereafter insights over the impact of particular emotions such as resentment in the rise and the dynamic of popular and populist mobilizations. Yet, a lot remains to be done as to the specification of the emotive components in different versions of populism. Most notably, this paper points to the fact that non speculative analysis should rest on specifiable and compatible theories of emotions, on the one hand, and on sound and solid methodological approaches. Using corpus linguistics techniques to study populist discourse is an empirical, bottom-up, approach based on verbal or multimodal texts representing populist ideologies. After a tentative definition of populist discourse(s), I give a brief overview of corpus studies of political discourse, in which populist linguistic practices are embedded. In particular, I present some corpus techniques for exploring political and/or populist discourse (e.g. by analyzing keywords or formulaic expressions) and then I discuss some widely studied strategies of political/populist discourse(s) from the perspective of corpus-based research (e.g. conceptual metaphors, representation of speech and thought). Finally, I offer some thoughts on potential developments in corpus-based analysis of political/populist discourse, examining new forms of corpora to create and new topics to cover. Our paper offers an introduction to corpora and corpus linguistics as a theoretical approach and a research method for the humanities and the social sciences. We review definitions and types of corpora, as well as their uses in a broad spectrum of analyses. We then illustrate their usefulness for social science research, presenting quantitative methods of analysis and a brief introduction to qualitative data analysis through examples concerning populism in Greek-speaking corpora. As can be appreciated, the linguist is not a sociologist or a political scientist or a philosopher; but s/he can cast the linguist’s glance at the usage of words (and linguistic phenomena at large), their place of occurrence, etc., that is, the linguist will try to contextualise as much as availably possible the use of lexis in focus so that they derive as much information as possible for a range of possible interpretations and the discursive processes surrounding it. This angle of analysis will obviously bring into the scene issues relating to identity construction, political legitimation processes and power relations The enterprise will hopefully inform and complement a broader non-linguistic analysis of the use of such terms as per title. We’ll try to look at what (a linguistic) discourse analysis can contribute to the analysis of lexes, in the case at issue of the word ‘populism’ but also of its Greek ‘equivalent’ term ‘λαϊκισμός’, esp. as we know that word histories have their own stories to tell and translational equivalence is often a myth. We’ll also see if corpus linguistics (a quantitative methodology) has anything to offer in our endeavour. Discourse analysis constitutes a theoretical and methodological paradigm with a significant influence in modern political analysis. However, the variety that characterizes the methods applied is symptomatic of a fragmented field of inquiry without sufficient internal coherence or interaction. In this paper I investigate possible ways to overcome this fragmentation, and to establish the cognitive conditions that will allow us to integrate several pieces of the respective theories into a more comprehensive approach. The proposed framework of analysis is based on a matrix of notions that could be used to fulfill this task, and also trigger new research directions in the field of discourse analysis. The financial crisis and the social changes occurring over the last three years in Greece have led to extremely high rates of youth unemployment, and to a heightened sense of insecurity and risk, especially among young people. The labor market has become increasingly precarious, and work experiences are fragmented. In this context, it is often difficult for young people to identify an end point to transitions. This situation inaugurated a discursive struggle about the meaning and the prospects of dealing with it. In my presentation I intend to analyze journalistic discourses about young people and their transitions both from family to education, and from education to work, and their future role in society, in an era of deep recession, risk, insecurity and precarity. In particular, I am very concerned about the discursive construction of youth in the Greek press, and the correlations of the journalist discourse with other discourses, such as that of science and politics. My main aim is to critically illustrate the relationship among these discourses, and their consequences in the control, and government of youth towards particular ethico-political and financial ends. Additionally, I search for the possible transformations of the discourses about “youth at risk” in an era of crisis, and consequently of the hegemonic governing model of youth. In so doing, I will draw both from governmentality studies and sociology of youth, and risk. I have chosen to analyze journalistic statements about youth and risk, as they were expressed in various articles. These statements were collected from a variety of popular Greek newspapers during 2013. I interpret those statements, texts, and declarations employing discourse analysis as it is expressed mainly by Foucault and the Essex school. This particular paper will focus on practical applications of Foucauldian discourse analysis, based on the methodology proposed in his Archaeology of Knowledge. As in social research it seems to be a common problem how to use Foucault, rather than merely discuss him, this paper is aimed at researchers who want to apply Foucault’s work to their own field of interest. Through the analysis of specific examples drawn from cultural studies, we will attempt to come to terms with his seemingly impenetrable terminology, and tackle some questions and issues that are often raised about his work. The main aim of this paper is to study populism and anti-populism in relation to the role of the Media: we focus on the narratives constructed for borderline (liminal) moments, like those of the crisis, the way the media mediate through the crisis the relation between the political and politics. In the case of Greece, the crisis is mediated using a variety of tools, following various avenues and with divergent intentions and aims. It is paradoxical, however, that all these mediations coincide on a rather dense meaning, apparently shared by all. This observation can a be the starting point for analysing a notional “choreography” from one Crisis Discourse and one predominant meaning of Crisis to multiple reactions and from the multiplicity of the reactions to the dichotomization of the actions, the dualism of the possible and preferred way-out. During the last four years of the crisis in Greece, there have been major changes at the political level indicated by the near-collapse of the traditional parties of government. The imposition of the memorandum can be considered as a dislocation, a moment when the established social and political relations were dismantled. The political crisis has also led to the dismantling of established political identities and to the emergence of new political formations. In this presentation we will focus on the Democratic Left party, which was founded in 2010. Democratic Left, like every emergent political formation, was accompanied by a very specific and characteristic discourse, designed to justify its existence in the domestic political map. In this work we will try to analyze the political discourse that constructs the identity of the Democratic Left. This discourse is mainly developed around the concept of ‘responsibility’ and anti-populism. The identity of the party was designed to rely on the populism-antipopulism division, placing the party against populism, while the notion of responsibility, which operates as an empty signifier, was used as a point of differentiation from the rest of the Left. For the needs of this presentation, 30 texts, from 2010 to 2014, have been analyzed. All texts have been recovered from the official website of the party. This paper highlights a certain reading of hegemonic discourses drawing on the work of Roland Barthes. Barthes’ Mythologies offer an insightful analysis of the discursive strategies articulated by ideological structures which disavow their contingent nature and present themselves as “common sense”. Attempting to codify these strategies, I suggest that myth deploys a second order semiological chain, a metalanguage, articulated around the processes of naturalization, de-historization, scientification and de-politicization. By placing certain social and economic orders into the realm of “naturalness”, myth establishes a consensus over the “obvious”, excludes antagonistic views from debate and allows the reproduction of dominant ideologies. The main argument put forward is that neoliberal discourse is articulated as a mythical one; its main moments are highlighted, and its implications for social theory and democratic societies are discussed. The collective subject (rabble, crowd, people, mass) emerged victoriously from the revolutionary flames of 18th and 19th century destined to dominate the social and political landscape throughout the following centuries. This collective subject comes with a double-faced inheritance: on one hand, it is the enlightened and unifying notion the philosophers glorify. On the other, the raging crowds of the “tricoteuses” and the “petroleuses” storm the social and political imaginary terrifying the bourgeois class. Through its trials and transformations it defines the future of democracy. Contemporary philosophy and social theory, in an attempt to answer the pressing demands to engage with state power, representative institutions, capitalism -both material and immaterial- usher new notions and practices of the collective subject such as the public sphere, the multitude, populism, civil society. The need for a way out of the impasse of post-modernism is felt, as well as the need to grasp the real passions and energies that run through the modern day crowds and harness them into social and political action. In this presentation I discuss whether these attempts are flawed because they fail to grasp the importance of two genetic problems. The first is a phenomenological problem and the second is an ontological one. These semantics of the collective subject fail to understand how deep the fear of the crowd runs even in our modern mass society and so they fail to recognize in their own work an attempt to tame the crowd. In addition, they probably fail to fully realize the degree in which the enlightened rational Kantian individual is still embedded in the political imaginary serving as the model for the collective subject, thus reducing it to a simple aggregate of individuals. Andreas Takis Is there any room for multitudes? Hardt and Negri in their Empire claim that the (social) contract of association is intrinsic and inseparable from the contract of subjugation, through which all autonomous power of the multitude is transferred to a sovereign who rules from above. Taking representation as the exclusive means for consolidating unity, and that a transcendental and misleadingly fictitious one, they renounce normative unity altogether, and turn to a rather mystical capacity of multitudes to be self-directed. One can doubt, however, the exclusivity of the link from representation to political unity. Turning plurality into a distinctive whole, into a collective agent, without relinquishing separatedness, has been for ancient political theory the special feat of (free and equal) citizens partaking in power in turns, under a common law. Their being associated in a unified whole is not mediated through their being represented by some sovereign, but rather through their instantiating in their plurality and concreteness at any given historical moment the abstract fiction of the res publica itself. Multitude then stands as a non-represented and non-representable entity of our political ontology and finds its empirical expression in situations of structural political crisis. Οι Χαρντ και Νέγκρι ανέλυσαν τις νέες μορφές κυριαρχίας που γεννιούνται με την έλευση του 21ου αιώνα, υποστηρίζοντας ότι «η δυνατότητα της δημοκρατίας σε παγκόσμια κλίμακα αναδύεται σήμερα για πρώτη φορά». Αυτή η δυνατότητα ονομάζεται σχέδιο του πλήθους. Προκύπτουν εδώ αρκετά ερωτήματα: μπορεί άραγε το πλήθος να καταστεί το υποκείμενο μιας πολιτικής της χειραφέτησης; Ποια είναι η σχέση του πλήθους με τον λαό, τις μάζες, την εργατική τάξη; Πώς θα αντιμετωπιστούν οι εσωτερικές αντιθέσεις του πλήθους, αυτής της «πολλαπλότητας μοναδικών διαφορών»; Μπορεί όντως το πλήθος να αυτοκυβερνηθεί δημοκρατικά; Στοιχεία απάντησης σε παρόμοια ερωτήματα μπορούν να προσφέρουν οι αναλύσεις του Μπαλιμπάρ, ο οποίος επισήμανε τη διαλεκτική που διέπει τις μάζες στη δημοκρατική προοπτική του Σπινόζα. Πρόκειται για διαλεκτική του φόβου: φόβος που νιώθουν και φόβος που προξενούν οι μάζες. Αυτή η θεμελιώδης αμφιθυμία των μαζών ορίζει εξάλλου τη δύναμή τους και, ταυτόχρονα, την αδυναμία τους. Θα επικεντρωθούμε λοιπόν στην συζήτηση των εννοιών του πλήθους, των μαζών και της δημοκρατίας. Η Λατινική Αμερική χαρακτηρίζεται από πολλούς ως ο τόπος όπου ο λαϊκίστικος λόγος διατηρεί ακόμα μεγάλη ισχύ, όπως και η έννοια του λαού (παραδοχή Negri και Hardt). Στο παράδειγμα των «Εκκλησιαστικών Κοινοτήτων Βάσης», του κυττάρου της Θεολογίας της Απελευθέρωσης της «Εκκλησίας του Φτωχού Λαού», ο Torcuato Di Tella βλέπει μια εκδήλωση του λατινοαμερικάνικου λαϊκισμού, δηλαδή της πατρωνίας των λαϊκών στρωμάτων από κέντρα εξουσίας (π.χ. Ρωμαιοκαθολική Εκκλησία), όταν ο Michael Löwy διαπιστώνει μια κίνηση κοινωνικής και πολιτικής απελευθέρωσης από τη βάση του «φτωχού λαού». Ποιος είναι όμως ο λαός των «φτωχών» για τη Θεολογία της Απελευθέρωσης (άρα πως σχετίζεται η ενικότητα και η πληθυντικότητα); Πως προκύπτει η καταστατική και ανεκρίζωτη ιστορικά «σύγκρουση» στην οποία καλείται να πάρει πολιτική θέση; (η Αμαρτία ως προσωπικός και κοινωνικός διχασμός εξαιτίας του εγωισμού/η Σωτηρία ως ενότητα της πολλαπλότητας μέσω της αγάπης). Είναι φαινόμενο συνάρθρωσης ενός πολιτικού ηγεμονικού μπλοκ για την λαϊκή κυριαρχία, την αλλαγή των κοινωνικών και πολιτικών δομών και την κατάκτηση του κράτους (Laclau/Mouffe) ή εντάσσεται στη μετα-πολιτική αντι-ηγεμονία; (Daniel M.Bell, William Cavanaugh και Matthew John Paul Tan). In the late 1990s law professor Mark Tushnet coined the term ‘populist constitutionalism’. Others followed talking about ‘popular’ or ‘political constitutionalism’ (Richard Bellamy). There is a growing scholarly trend, albeit not yet a movement, which rejects the legalistic approach to the constitution, i.e. the idea that the constitution means what the judges of a constitutional or a supreme court say it means. Populist constitutionalism contends that political parties, social movements, and ultimately ‘the people themselves’, have an equal say on the constitutional meaning. The people, thus, not only act as the constituent power (only to disappear thereafter) but they also shape, through the course of everyday politics, the way the constituted powers apply and interpret the constitution. Τhe Essex School approach to democratic politics and collective action has attracted criticism from approaches focusing on the relation between verticality and horizontality in contemporary democratic movements and highlighting the importance of autonomous political initiatives which a theory of hegemony through vertical representation could not capture. In effect, critical theories of post-hegemony and horizontal politics in the last decade or so have issued multiple times the death certificate of hegemony cast as the politics of identity, ideology, totality, the party and the state apparatus, representation and hierarchical, top-down power (Beasley-Murray 2010; Arditi 2007; Hardt & Negri 2009, 2012; Day 2005). We will address such objections by showing how the politics of hegemony, properly understood in the terms of Laclau and Mouffe, are intrinsic to radical democratic mobilizations and contemporary democratic agency. Στην παρούσα ανακοίνωση επιχειρούμε να αναστοχασθούμε πάνω σε μια θετική εννοιολόγηση του ‘λαϊκισμού’. Χρησιμοποιώντας συνδυαστικά την ανθρωπολογική ανάλυση και τον φιλοσοφικό στοχασμό προβληματοποιούμε τις εννοιολογήσεις του ‘λαϊκού’ στην Ελλάδα, από to 1980 μέχρι την εποχή της κρίσης. Αναζητούμε τις μεταλλάξεις της ‘λαϊκότητας’ όταν αυτή έρχεται στο προσκήνιο και βιώνεται συγχρόνως με αρνητικές και θετικές συνδηλώσεις. Η αμφισημία της έννοιας της ‘αξιοπρέπειας’ στην οποία εστιάζουμε, ακριβώς επειδή αποτελεί το πιο πρόσφατο κεντρικό ζητούμενο πολιτειότητας ‘από τα κάτω’ (βλ. μέσα από τις πλατείες και τα κοινωνικά κινήματα), μας επιτρέπει να ερμηνεύσουμε τους τρόπους με τους οποίους μπορεί να βιώνονται οι πρακτικές των υποκειμένων τα οποία δρουν ως πολίτες με συγκεκριμένες συντεταγμένες αισθητικής στην καθημερινότητα της κάθε εποχής: μεταξύ καθυπόταξης στο κυρίαρχο (βλ. εθνικό αφήγημα και επιδεικτική κατανάλωση), αλλά και χειραφέτησης με αναζήτηση εναλλακτικών τρόπων ζωής. Σε κάθε περίπτωση τα σχετικά βιώματα μπορούν να γίνουν κατανοητά μέσω της κριτικής εξέτασης όχι μόνο των λόγων αλλά πολύ περισσότερο των παθών των σωμάτων. During the occupation of Greece by the Axis powers, a powerful Resistance movement emerged in the form of EAM (National Liberation Front), an initiative of the Greek Communist Party. Like elsewhere, in Greece also, the Resistance movement combined the struggle for national liberation with a program of postwar social transformations. The postwar ascent to power presupposed a construction of a vast social alliance. An accordingly formed discource was applied not only to describe, but in a performative way, to change relations of forces, and simultaneously a tactic of indirect hegemony within the political system was put forward. The political goal was described as a variation of People’s Democracy (Laokratia) but the main slogan remained that of National Unity. The exact relationship between those two notions will be the topic of this presentation. 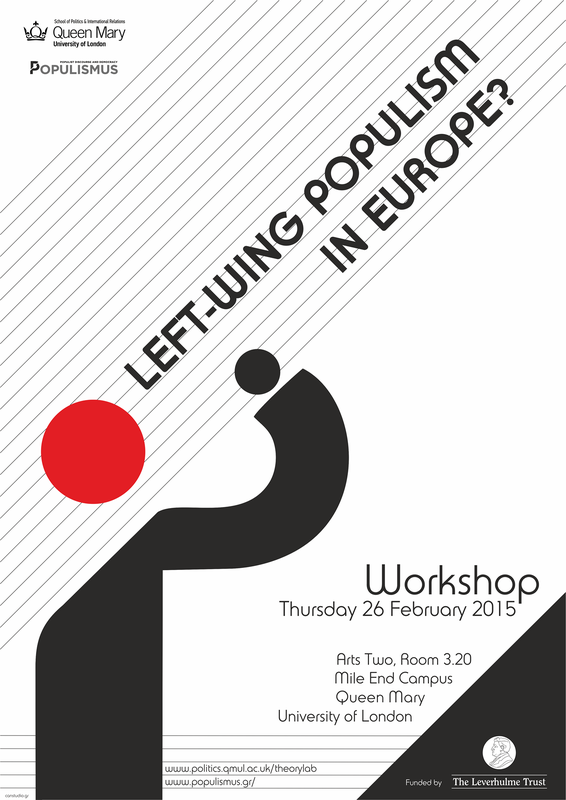 This presentation seeks to critically analyze the approaches of the extreme right phenomenon (parties, movements, mobilizations), as this has been developed in Europe from the mid 1980s up until today; these approaches have mainly focused on populism and its distinctive ideological features, something that will be at the centre of our attention. In these terms, our case study will examine whether the notion of “populism” can provide an interpretative framework for the understanding of the contemporary extreme right. After we give the “minimum definition” of the term “populism”, we will then present the basic populist approaches to the extreme right phenomenon. These approaches will underline the most important populist features that are embedded in extreme right. This will lead us to some critical points for the understanding of the phenomenon. Building on the ‘pathological normalcy’ thesis (Mudde, 2010), the paper aims at exploring the ideological relationship between the ‘institutional’ Greek Church and the neo-Nazi Golden Dawn party. To this end, the paper explores two interconnected themes: a) the significance of religion within the party’s populist frame; and b) the past religious populist discourse as a factor for the party’s growth. Overall, the paper argues that: a) the Golden Dawn has expanded its influence, via conceptualizing religion in nativist terms as a criterion for belonging to the ‘people’, constructing in parallel a self-image of the ‘custodian’ of the traditional value system against the secular elites; and b) the church has not substantially contributed to the establishment of a ‘cordon sanitaire’, partially due to the ‘faux’ populist discourse (Mammone 2009) of its bureaucracy that has actually worked as the breeding ground for the social legitimization of the party ideology. For more than two decades the debate around European populism, both in its journalistic and its academic context, has been almost monopolized by the extreme right-wing parties that followed the impressive rise of Le Pen’s Front National in France (late 1980’s). Hence, in the European context, populism soon became almost synonymous with the extreme right, denoting xenophobic, nationalist, anti-democratic and/or anti-European tendencies. But this picture was soon destabilized and diversified by the emergence of various movements and parties that did not fit the ‘extreme-right’ banner. In fact, a significant number of them could be clearly identified as left-wing or even radical left (e.g. Front de Gauche in France, Die Linke in Germany, Podemos in Spain, SYRIZA in Greece; not to mention here the ‘square movements’ in Greece and Spain that can be described as grassroots populist movements). In my presentation I purport to show that it is through a discursive framework that we can properly register these latest developments in populist politics and comparatively assess the significance of each case and its relation to democracy in a way that is both theoretically consistent and analytically operational. Empirical examples from the European political landscape will be used in order to illustrate the importance for this shift in populism research. Bulgarian liberal intellectuals have argued that “populism” is not a danger to democracy itself, but a constant threat of “excessive” democratic contestation from below of the liberal consensus. My main argument is that opposing “the people”, understood in this way, was formative for the constitution of liberal subjectivities in post-socialist Bulgaria. Liberal anti-populist discourses, nevertheless, have undergone deep transformations in several political conjunctures, which I trace in this paper. Late 1990’s austerity was dubbed “anti-popular”, but was presented as a “civilizational choice”. By 2005 liberal anti-populism was directed against the rise of the far right. After 2009, however, when the far right supported the center-right austerity government, “populism” was identified with protest movements, a process that culminated in the mass mobilization against high electricity prices in February 2013. In July 2013 a new protest movement erupted, against the appointment of a media mogul as head of state security by the new government, but it was explicitly supported by mainstream anti-populist activists and intellectuals. The latter movement, however, was articulated as a “community of independent individuals”, part of the “creative class”, calling for “morality in politics”, against the social demands of the undifferentiated unity of the “popular masses” in the preceding February protests. In this paper the axes of political competition using correspondence analysis before and after the crisis were analyzed using the electoral results for the parliamentary elections in Greece 2009 and 2012a, 2012b. Furthermore, using the data from the surveys for the general population we get the attitudes for a number of social variables connected with vote for each party. By this approach we get evidence for cleavages structure. We use a two step procedure, computing first via multivariate correspondence analysis principal axes and loadings. In the second step through cluster analysis the attitudes are grouped in clusters. Finally, the issues ranking for candidates and general public are analyzed. Changes in issue ranking before and after the crisis, may reveal people’s and candidates’ way they realized the crisis. The role of populism can also be illuminated.